Since our blog is called Our Past Tents, we figured we'd show everyone the tents we've owned in the past. This is the first tent that Bryan owned as an adult. He ordered it from Campmor while he still lived in the dorm during college. 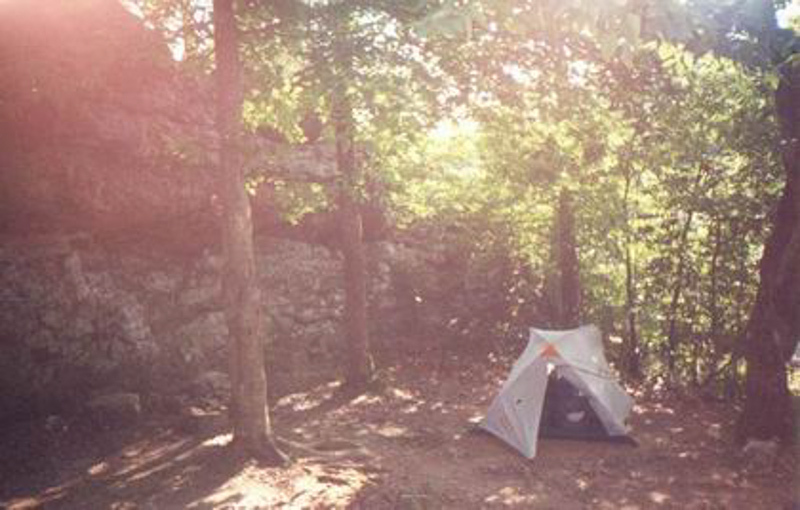 Photo: This is actually a photo of the tent from Bryan's first backpacking trip (solo, in July) on the Little Missouri Trail, Arkansas (1999). This campsite has become a favorite swimming hole to enjoy with friends. After bending numerous tent stakes on Arkansas rocks, and getting tired of looking for level places to set up a tent, Bryan bought a pair of these hammock-tents from Hennessy Hammock. 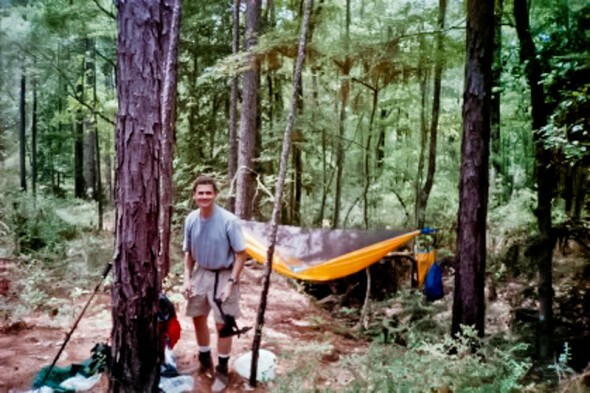 Photo: John Collins borrowing Bryan's hammock on a backpacking trip in Louisiana. Bryan still thinks the hammock is a wonderfully comfortable place to sleep though since getting married he's more often than not found in my tent. Our daughter has discovered the joys of hammock camping, though, and chooses to use it fairly often if the weather is warm enough. 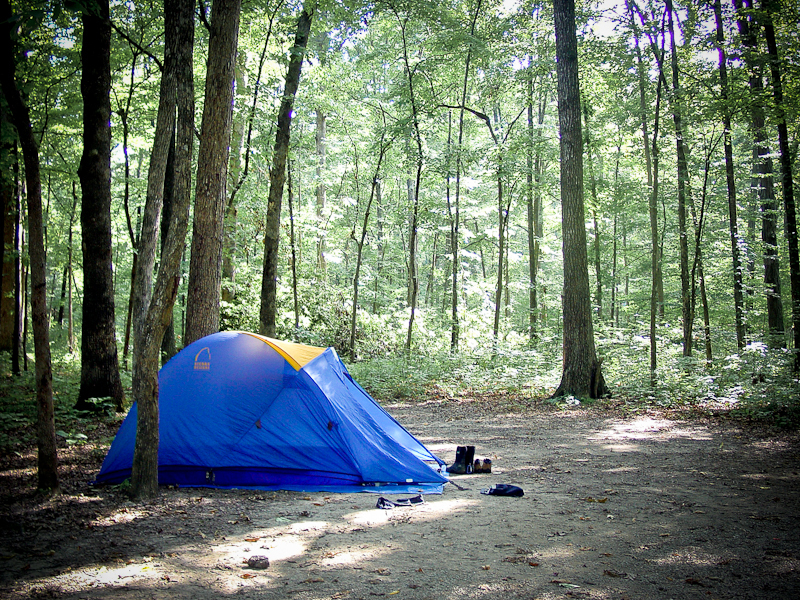 Photo: Trying to take a nap at Cox Creek Lake, Arkansas after a day of bike touring (2011). While the WRX was adequate for in-car sleeping, I finally decided that practicality was more important than being able to drag race teenaged boys at stoplights. It was traded to the dealership for a more appropriate grownup Subaru, which would comfortably accommodate four plastic bins. Early in the Single Mommy Days, it became clear that Mandy and I needed a decent tent. 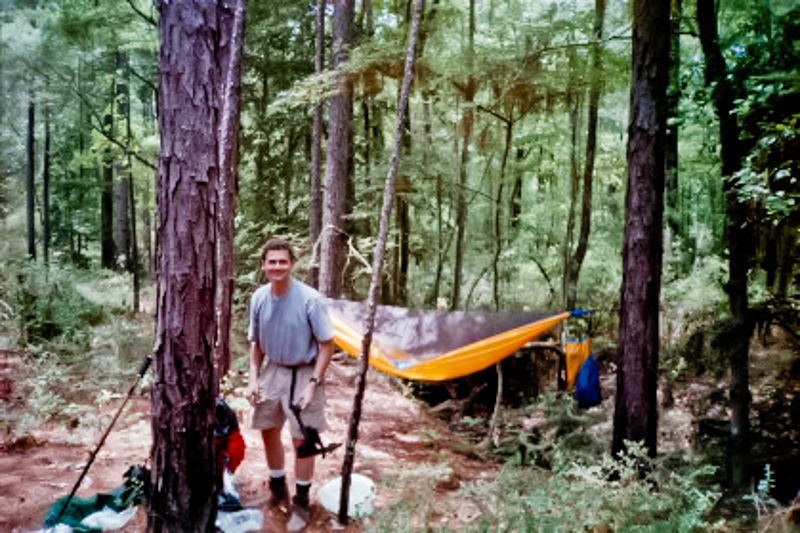 We were camping a lot and backpacking a little. My brother perma-loaned me his SD tent and I gratefully accepted. Photo: No idea where, no idea when. This truck has served Bryan well over the years and the only complaint about it today is it really only holds two people. When purchased, the idea that Bryan would need room for three wasn't even considered. 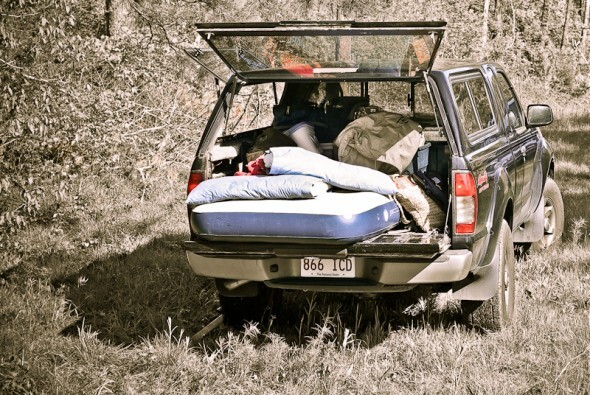 The camper shell holds plastic bins full of gear and sleeping on an airmattress is a luxury. Purchased for use on our honeymoon backpacking trip to Saguarro National Park, this lightweight, singlewall tent is HUGE on the inside and makes use of hiking poles for support. Today this is the tent of choice for Mandy. 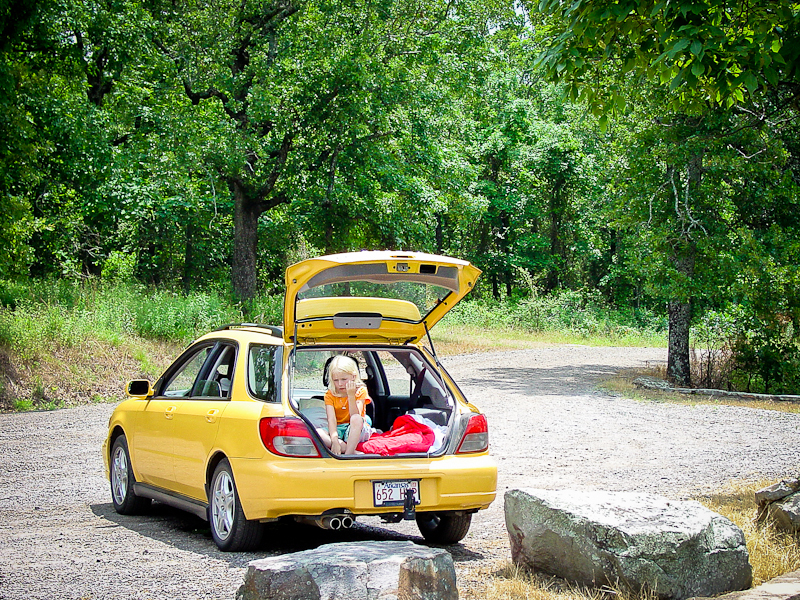 Photo: Lake Ft. Smith State Park, Arkansas (2008). Our friends, Britt and Debbie, decided we needed a four person/four-season tent prior to our honeymoon trip. This was a tent they had in storage and they offered it to us. The door zippers don't function anymore but it is huge and warm inside due to the lack of mesh. 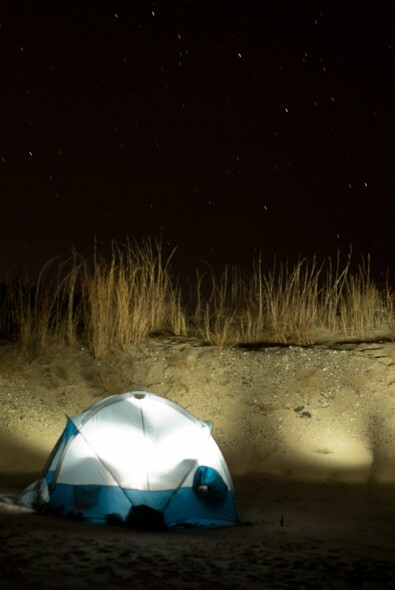 Photo: It was nearly midnight when we pulled into Monahans Sand Dunes State Park, Texas (2008). Before going to sleep, we took this long-exposure shot. It got down to about fourteen degrees that night. When we started bike touring, we bought this tent with an REI dividend because we wanted a lightweight tent that didn't require hiking poles to set up. It's been a good purchase, and in the winter we often 'fast pack' it, sleeping under just the fly without the tent body. Photo: We camped at a ballpark in Marthasville, Missouri while riding across the state via the Katy Trail (2011). 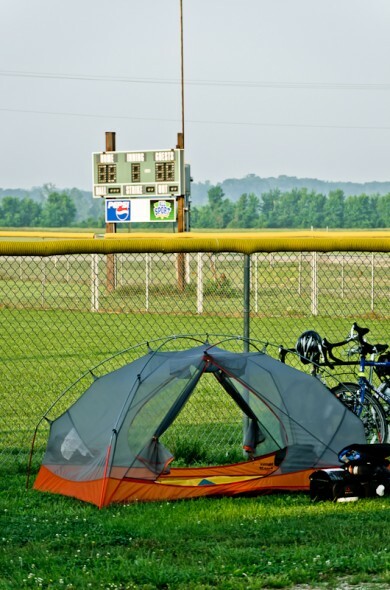 When we arrived and set up camp, Little League games were still in progress. It's the little odd things like this that I love most about traveling - the thing I remember most fondly about the whole town of Marthasville is the conversation we had that night with three little kids, waiting for their big brother's game to conclude. We have two of these, and we love them. 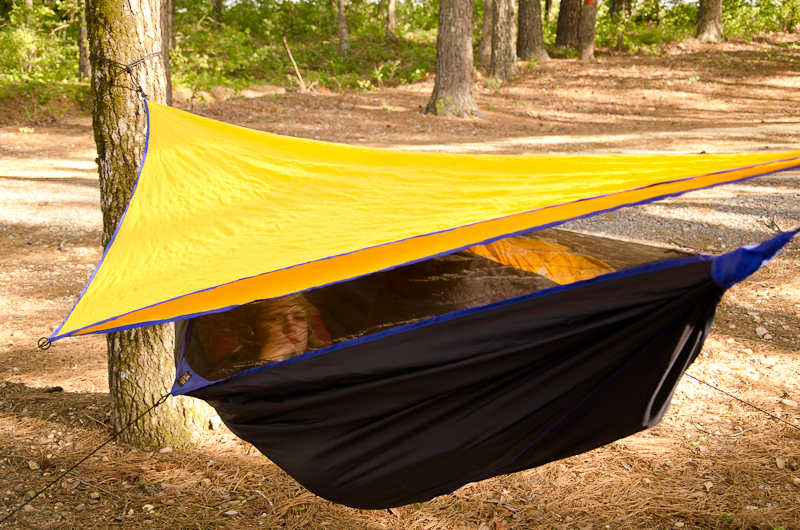 They're light, quick to set up, and super comfy for napping and reading. When bugs aren't a problem, they're good option for warm-weather overnights. 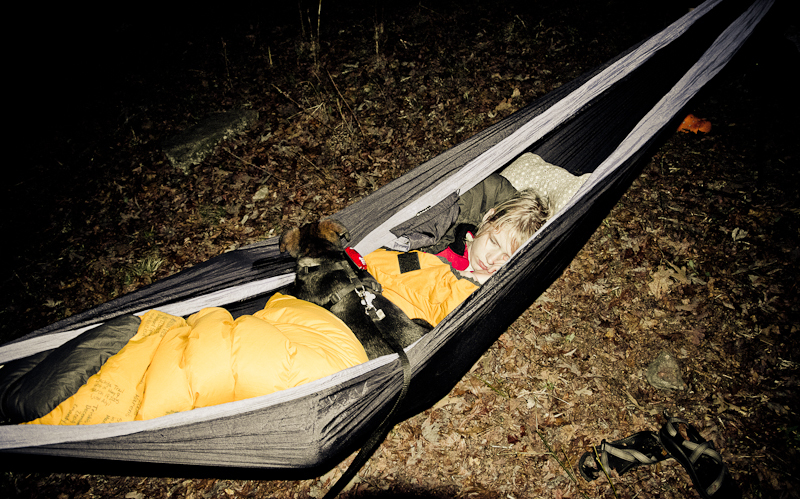 Photo: Mandy and baby Hayduke attempting to sleep while backpacking on the Ozark Highlands Trail, Arkansas (2011).